For all their many years of experience on the World Match Racing Tour, Johnie Berntsson and his Flux Team, and Bjorn Hansen and Nautiska Racing were not expected to make it very far this week in Copenhagen. But the wily old Swedes defied the odds to make it through to the Super 16 without having to submit themselves to the pressure of the Sail-Offs. Out of the four Qualifying Groups, Group 4 was the most competitive. Even GAC Pindar skipper Ian Williams struggled yesterday but today the six-time Match Racing World Champion hit his stride to break clear. For the other four skippers trailing in Williams’ wake, it all came down to who beat who in the last of their seven heats. Berntsson burst off the line to take the lead just when he needed it, his first race win propelling him to second in his group just a point ahead of Hansen, whose third place took him safely through to the Super 16 Knockout a point in front of Dane Michael Hestbaek and Team Hydra. The Dane’s flashes of brilliance yesterday earned him two race wins, but he couldn’t repeat that kind of form today. Much more surprising though was to see Swede Hans Wallén struggle, the Fremantle finalist not enjoying the softer breezes seen in Copenhagen so far. “These light winds are good for the new teams,” said the Olympic Star silver medallist. “There are not many multihull skills required in these conditions, so the learning curve is easier for them. It would be nice to have the stronger winds [like Fremantle] but I don’t think we’ll get them this week,” he shrugged philosophically. Other easy winners of their qualifying groups were Taylor Canfield and Mattias Rahm. It was a close battle for top honours between young gun Nicolai Sehested and his Trefor Matchracing team and France's Yann Guichard and Spindrift racing, but in the final race the fearless Dane got the better of his French rival and topped the group by a point. 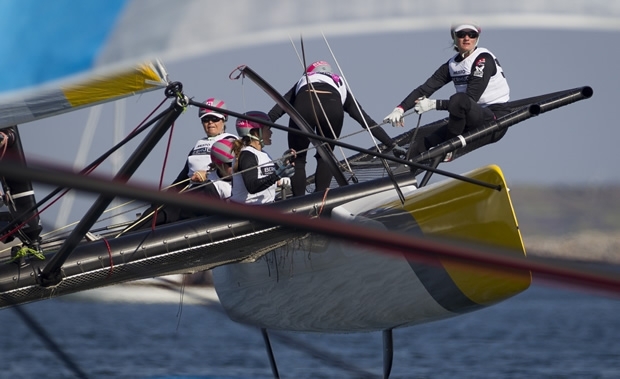 After a slow start on day one, Sally Barkow and the all-girl crew on Team Magenta 32 started firing on all cylinders. They saved the very best for the last race of the day, pulling an aggressive luff on Taylor Canfield at the start, sticking a penalty on US One as they cruised away to an easy victory, their first of the World Match Racing Tour. Wednesday is Sponsor Day, an opportunity to entertain corporate guests and VIPs, and then it’s time for the bottom eight teams to enter the Qualifying Sail-Offs, to see if they can fight their way through to the Super 16, the beginning of the knock-out phase of the competition.